C’MERE LARS! : Before being kicked out of Metallica, Dave Mustaine left his songwriting prints all over that band’s classic first two albums. Dave Mustaine doesn’t do interviews so much as he takes them hostage. Calling from California to discuss his latest album, “Endgame,” one has to wonder if even a root canal could interrupt the Megadeth mouthpiece. Ready and apparently then some, Mustaine brings Megadeth to Sunken Gardens Theater on Tuesday for a snarling display of speed-metal supremacy. Machine Head, Suicide Silence and Arcanium open the show. 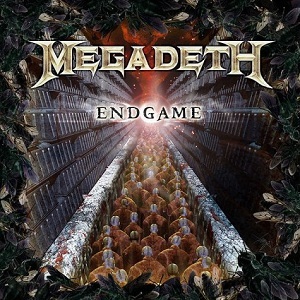 Touring in support of “Endgame,” Megadeth is back with an excellent twelfth album full of head-rattling riffs, shred-tastic guitar noodling and the venomous vocals that have made Mustaine one of the most polarizing and politically outspoken personalities in heavy metal. FAIR GAME: Despite a lack of promotional push, Megadeth’s 12th album was a ferociously good effort. As one of heavy metal’s most accomplished architects, there is no second guessing Mustaine and his contributions. An original member of Metallica and the mastermind behind such classic Megadeth albums as “Killing is my Business …and Business is Good,” “Peace Sells … But Who’s Buying?” “Rust in Peace,” “Countdown to Extinction” and “Youthanasia,” the always outspoken and opinionated Mustaine is credited alongside Slayer, Anthrax and Metallica with creating and perfecting thrash metal. “Am I satisfied? No,” Mustaine asks and answers. “Am I content? Yeah. Is there a difference? Sure there is. Content, for me, is being placated and active versus being satisfied, which means you’re in a place where you don’t want anything else. Would I rather have a belly full of beans or would I rather have a very nice dinner of sushi? 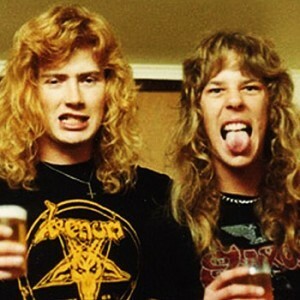 DRINKING IS MY BUSINESS … Mustaine and Hetfield displaying great fashion sense during the early daze of Alcohollica. “Endgame” got a shot of fresh blood from new guitarist Chris Broderick, formerly of Jag Panzer, who joins journeyman bassist James Lomenzo and drummer Shaun Drover. “The relationship with Chris is really unique because he’s such an incredible talent and, fortunately for me, he’s either really humble or he’s either really unaware of how great he really is,” Mustaine says. 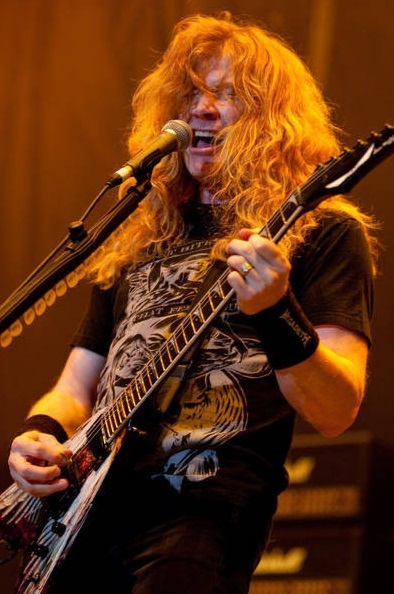 Besides leading his band, Mustaine recently began programming music and telling stories on the Internet radio station Megadeth Radio, available at www.iheartradio.com. 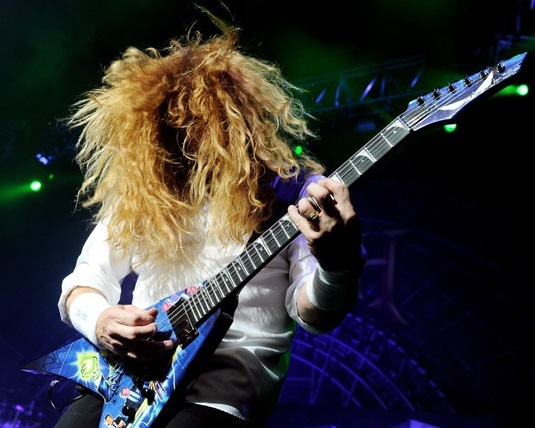 WHITE SHREDDING: Somewhere along the way, Mustaine traded his Venom T-shirt for a wedding-ready, button-down number. Can someone please get him back in black? As a parting shot, Mustaine lightens up and takes it all in stride.